Good afternoon everybody! 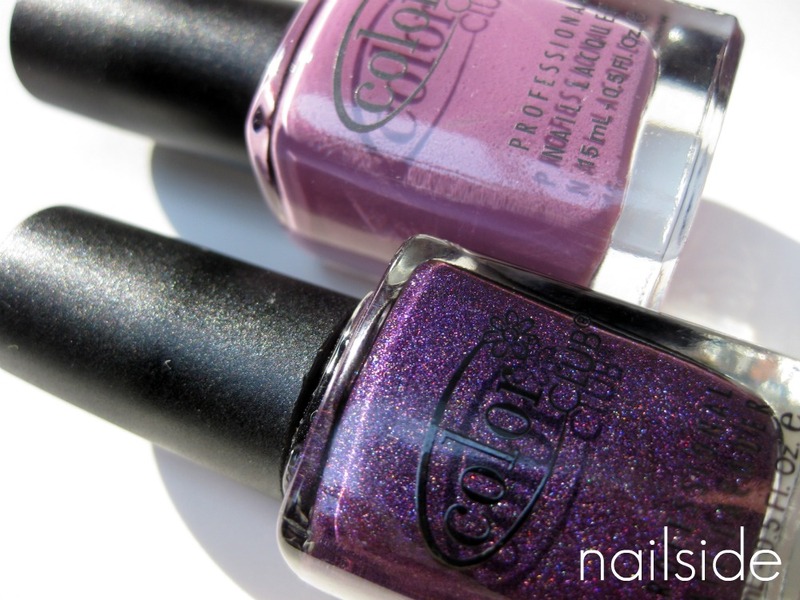 For this post I want to show you a purple mani for which I used Color Club's Uptown Girl and Wild at Heart. Though I'm not a huge fan of purples I knew I wanted to have the purple holo Wild at Heart the moment I saw pictures of it. 'Cause holo's I like :) And this holo covers very well, which is nice for the freehand nail art I did here. Now this does not count for Uptown Girl that I had to apply three coats of for complete opacity, but the formula is nice and the drying time okay so it wasn't that bad. For the stars I used a tiny, tiny paintingbrush, I kind of painted them randomly on the nails. Then I used a dotting tool from Essence to fill up the gaps between the stars. So what do you think of purples? And would you like to see more purple manis in the future? Great manicure. I love purple although have not worn for a while. I have Wild at Heart on my shopping list for my next polish order. @pkbmum: Thank you for your comment :) Good choice to order WAH, it's so pretty in direct sunlight! Great combo. Your stars are so perfect too!